Corporation of Scottsdale, Ariz., illustrating and describing fea- tures which can provide fuel savings up to 30 percent for ves- sel owners. Monitor 205 microprocessor dis- play unit, sensors and optional printer, and analog display units. Digital display keyboard controls are captioned in an illustration shown across two pages so that every function can be clearly un- derstood. A fuel-performance curve illustrates optimum fuel efficiency speeds. Information on dealer installation, operation re- quirements, size, and power spec- ifications are outlined. The Avicon Monitor 205 pro- vides information on fuel flow, speed through water, RPM, pro- peller slip, time and distance to waypoint. After initial program- ming the Monitor 205 presents all the data needed for evaluat- ing performance and for setting up fuel-saving procedures at the push of a button. Early warning alarms may also be programmed for critical parameters of engine speed or fuel consumption and to provide easy detection of en- gine malfunctions which could require costly repair. Depending on vessel size and operation, Avi- con reports this system can pay for itself in one month's time. The Monitor 205 can be used for single or twin engine, diesel or steam, and with light and heavy fuel oils. A two-year lim- ited warranty is provided. New area offices in Perth, Aus- tralia, and Singapore have been established by Jet Research Cen- ter (JRC) of Arlington, Texas. The facilities will provide the complete range of JRC explosive technology to the petroleum, ma- rine construction, and dredging industries. Ron Woods, area manager-busi- ness development, will headquar- ter in JRC's Perth location. Mr.
Jet Research, one of the rec- ognized leaders in explosive tech- nology, is a subsidiary of Halli- burton Company, Dallas, Texas. The Ariel transports dry bulk cargo, containers, and large pipes and is also capable of carrying liquid cargoes such as crude oil, light heating oil, and petroleum products, or a combination of dry and liquid cargoes. K8SZ 70150 CL diesel engine pro- ducing 16,520 bhp at 130 rpm. 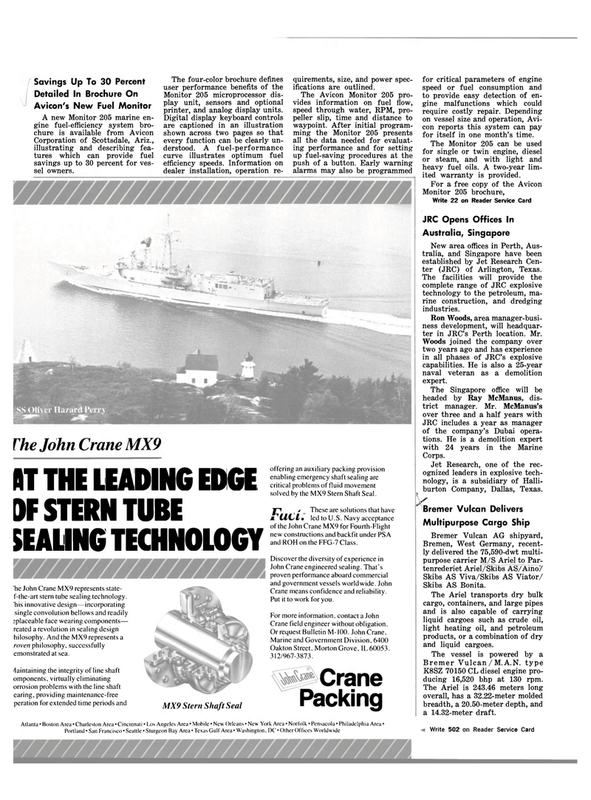 SEALING TECHNOLOGY 'he John Crane MX9 represents state- f-the-art stern tube sealing technology, 'his innovative design—incorporating single convolution bellows and readily splaceable face wearing components— reated a revolution in sealing design hilosophy. And the MX9 represents a roven philosophy, successfully emonstrated at sea. offering an auxiliary packing provision enabling emergency shaft sealing are critical problems of fluid movement solved by the MX9 Stern Shaft Seal. jri > These are solutions that have a UL/if led to U.S. Navy acceptance of the John Crane MX9 for Fourth-Flight new constructions and backfit under PSA and ROH on the FFG-7 Class. Crane means confidence and reliability. Crane field engineer without obligation. Oakton Street. Morton Grove. IL 60053. 312/967-3873.